A peculiar navigation through the stormy waters of the band with a mission. The ones wishing to devour a bite-size history of Procol Harum should go no further than the group's debut single: A Whiter Shade of Pale backed with Lime Street Blues tell it all concisely by combining the grand and the blunt. Yet stopping within two first tracks of this lavish four-disc box would mean missing the point of the ensemble's existence. They might emerge fully-formed and never really change the tack but there's more than meets the eye in the Procol treasure chest, open for all to see. Still, if you look for the obvious, the best place to dwell on is Salvo's 2CD collection, The Secrets Of The Hive, while those subscribing for the whole journey are faced with a danger of overlooking obscure gems hidden between the albums' lofty peaks. Hence All This And More..., which embraces it all on both aural and visual levels that, what with Keith Reid's image-rich lyrics and Gary Brooker's music, have never been separate as reflected in Demis Roussos's amazement on a video part of the package. A big mistake, then, is dividing it into two studio CDs, one live compilation and a mix from previously released DVDs, because everything's accounted here. So if the selection on the first disc – studio tracks are lined chronologically here – feels a bit strange with cuts like Long Gone Geek and the entire epic of In Held 'Twas In I but no Whisky Train or Conquistador, the inevitable question is addressed in the opening title of the second platter: it's Your Own Choice. Anyway, the latter of those two shines on in 2003's version on the DVD and the former found its way on to a concert CD. There are real rarities on it, including 1973's orchestral take on TV Ceasar from Hollywood Bowl, Juicy John Pink from 1970's Isle of Wight Festival, and 1993's Last Train to Niagara which has only been played on-stage and is a short history of the band in itself. That quite makes up for the absence – save for the inspired reading of Johann Strauss's Blue Danube from 1974 – of unheard material such as demos and out-takes that embellish the remastered albums. Inclusion of two variants of As Strong as Samson and Broken Barricades, the originals and live ones, an audio and a video track, are justified nevertheless revealing high nicely the band's sound projects before the public, no matter how complicated a recording is. More so, what this compilation clearly underlines is what a tremendous drummer BJ Wilson was. 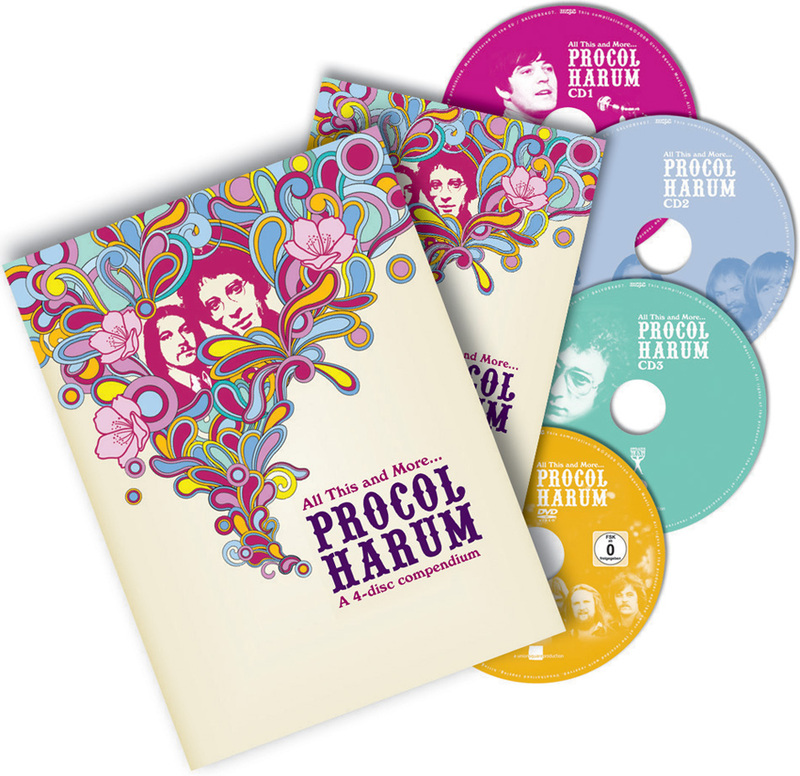 With a 72-page booklet to put this bonanza for ears and eyes in a context – historical and musical – the box is as great a launch-pad into the world of Procol Harum as a perspective-shifting device for the well-versed in it. Not a simple greatest hits compilation, All This And More... adventurously goes beyond the expected, and that's what makes this peculiar navigation so arresting.